Lately I've been playing a LOT of Disney Infinity on the PS4, getting it loaded on my Android phone and obsessing over all the possibilities of what's to come. I've seen over the last few months tons of rumors, art, and leaked information such as the Mulan character- but what has me the most captivated is the Star Wars rumors. Obviously, as Star Wars is in a resurgence of popularity, Disney would most certainly like to capitalize on that with the Infinity game. It would work just as well as the Marvel heavy 2.0 series so it makes sense both financially, and for sheer entertainment value. Now a German retailer has leaked not just a picture of the box set, but a rough date and price as well. 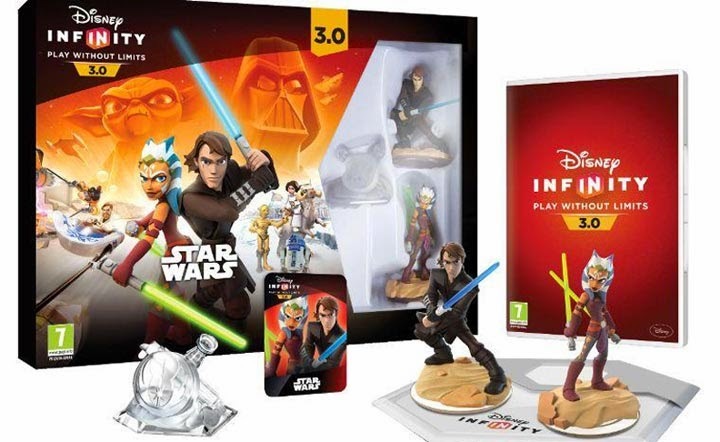 This particular set is the 3.0 starter playset with Anakin Skywalker and his Padawan Ahsoka Tano from Star Wars: The Clone Wars television series. It should be of note that there are numerous other characters shown on the box, that will presumably become playable toys to purchase separately. The retailer's website listed the release date as August 15 and price range as $67-79 with the set being released on PS4, PS3, Xbox One, Xbox 360, and the Wii U. Now we play the waiting game until Disney Interactive publishes an official announcement. One last thing, the official Disney Infinity Twitter account tweeted this gem in German, which translates into Yoda's highly recognizable speech pattern- "Patience you must have." A sly and clever response to the leak!